When you think of comfort food, do you think of a hearty stew? I do! I must say though, that I usually think of a stew simmering on the stove or in the oven for hours. 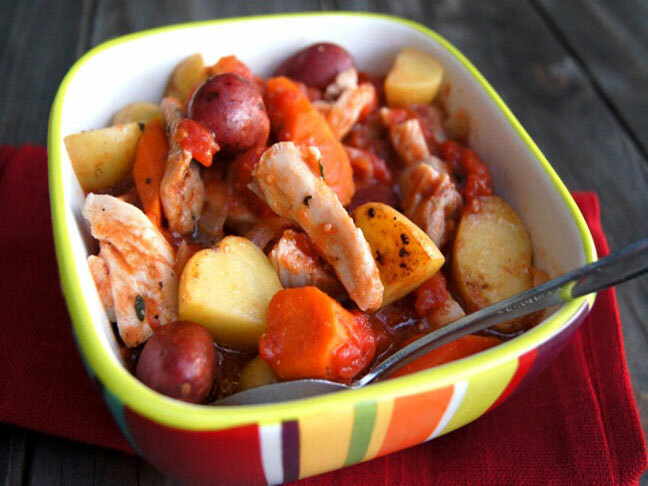 This chicken stew, however, is quick and easy, cooks in about 30 minutes and develops very rich, wonderful flavors. Top brown rice with it, and you’ve got a healthy, one pot meal that’s comforting and delicious! A perfect family dinner for a cool fall night! Coat the bottom of a large oven safe skillet with olive oil. Place the skillet over medium high heat and add the onion and garlic. Cook just until the onions are soft, about 3 minutes. Place the chicken thighs on a large plate, season both sides with salt and pepper, and add them to the skillet. Lightly brown both sides and remove them from the pan, and put them back on the plate. This should take about 1 minute per side. Add the potatoes, carrots and thyme to the pan and cook for about 10 minutes, stirring every couple of minutes or so. Add the tomatoes, bring to a simmer, and return the chicken to the skillet. Use a spoon to cover the chicken pieces with the sauce. Bring to a boil, and immediately place the skillet in the preheated oven until the chicken is cooked through, about 15 minutes.